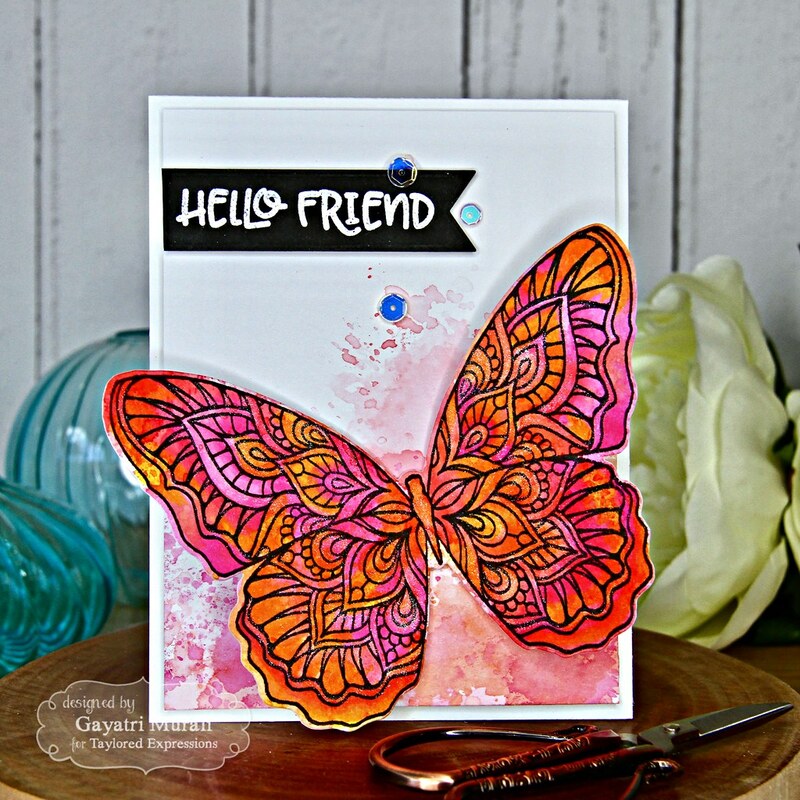 Today I am sharing with you two cards using Taylored Expressions Big Butterfly stamp. I love love this gorgeous butterfly. Not seen anything like this before. 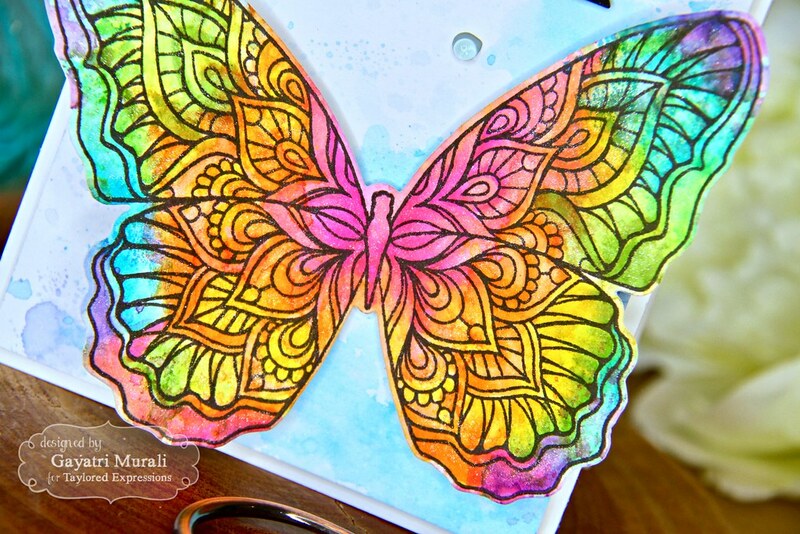 The design inside the butterfly is beautiful and can be coloured with any medium. 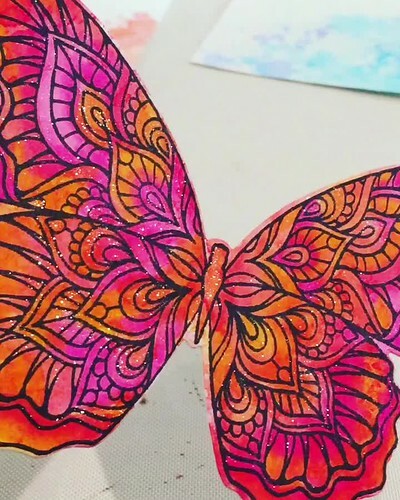 I used inks smooshing and copic colouring to colour my butterflies. Yes I did two of the them and made two cards. Here is the first card. Here is how I made the butterfly. I smooshed Picked Raspberry, Ripe Persimmon and Carved Pumpkin distress inks on TE watercolor paper. I did layers of ink smooshing. After each layer of ink smooshing, I dried the paper using heat gun. This brings out the hard and soft edges in each layer. I did three or four layers of ink smooshing. 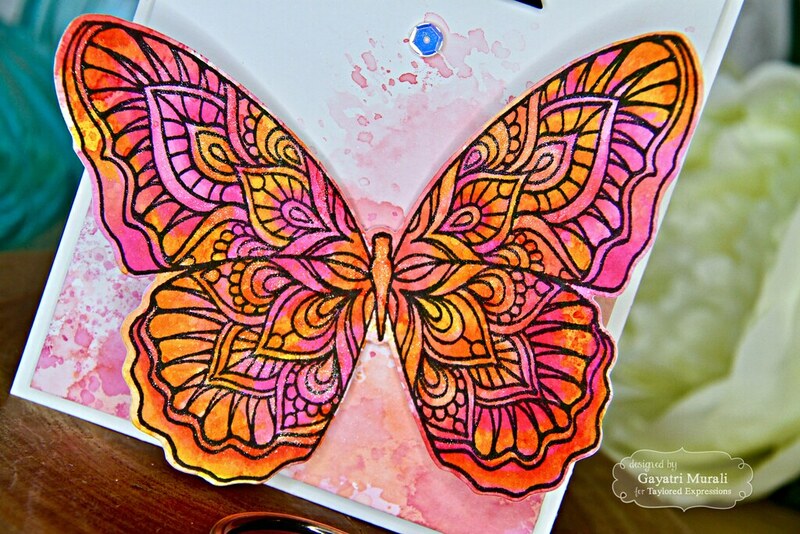 Once the paper is dry, I stamped the Big Butterfly image on the paper using MISTI to get good and even coverage of the black ink. 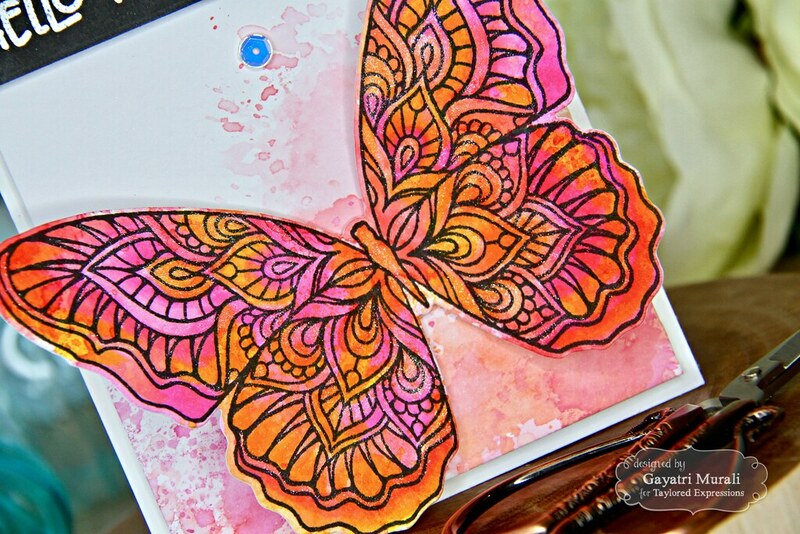 I then used copic markers to add shading to the design inside the Big Butterfly. You can still see the distress ink layers beneath the copic shading. Then I die cut the image using the coordinating die. I added shimmer using Nuvo shimmer pens. 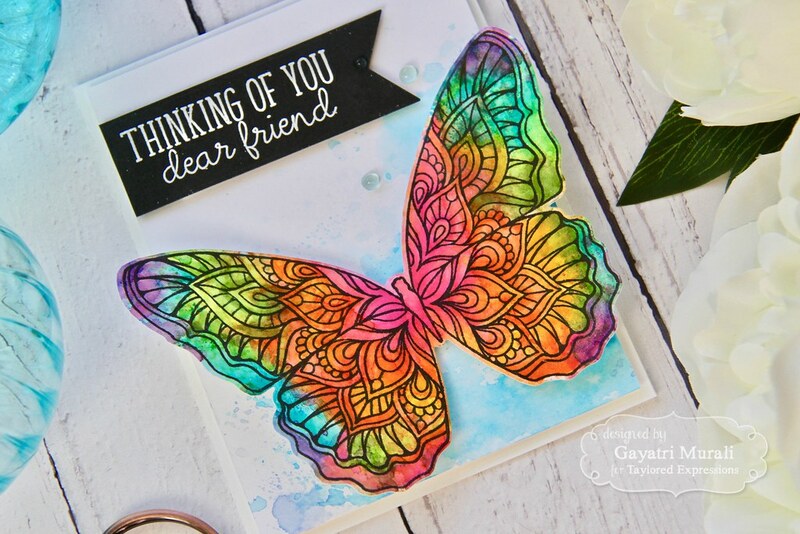 To make this card, I ink smooshed a watercolour panel using the same distress ink but diluted the colours. I focussed the inks on the bottom right of the panel. Then I trimmed the panel to 4’X5.25″. I adhered the butterfly at an angle on the ink smooshed area of the panel. The sentiment is from Friendly Phrases stamp set which I white heat embossed on strip fo Oreo cardstock and die cut using Double Ended Flag die. I adhered the sentiment strip on the top left corner of the panel using foam adhesives. I added a few sequins to complete the card. This panel is adhered on Sugar Cube card base. I love how gorgeous the butterfly turned out. Keeping the butterfly as the focus and highlight of the card, I kept the background simple. All supplies used to make this card are listed below. 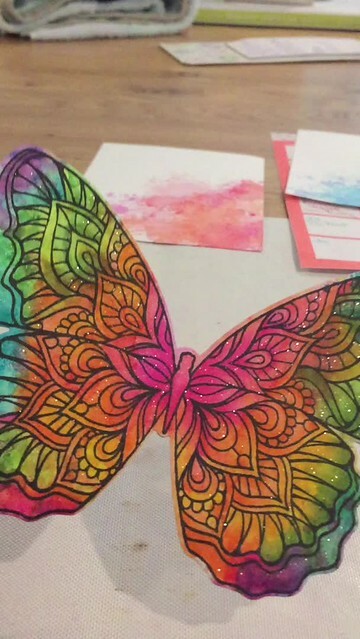 Now for the second butterfly, I decided to make a rainbow coloured butterfly. 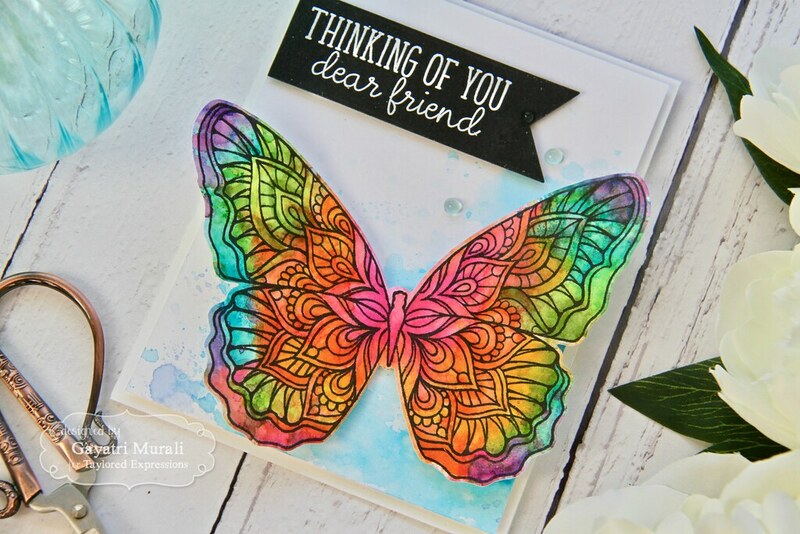 I followed the same process as before but with more distress ink colour to make this butterfly. 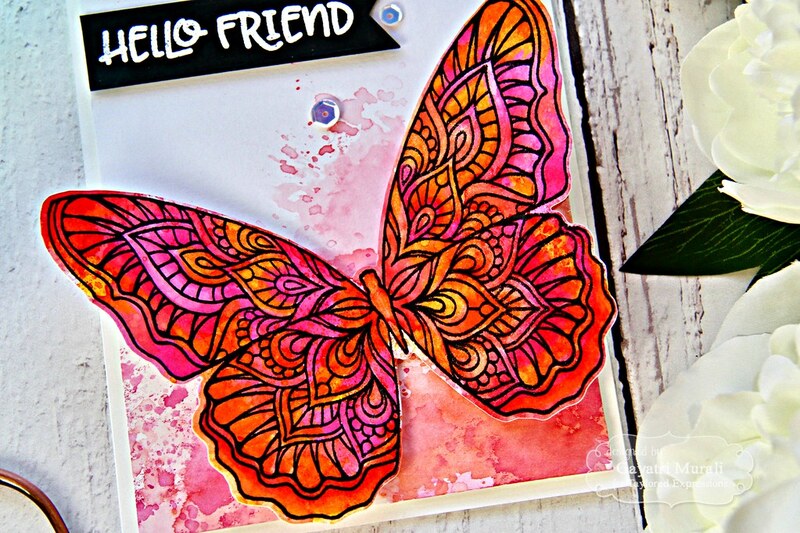 I used Picked Raspberry, Candied Apple, Carved Pumpkin, Mustard Seed, Twisted Citron, Peacock Feathers and Wilted Violet distress inks to smoosh on TE watercoloured paper. Again the most important thing is to dry between each colour. Otherwise you will get mud colour. 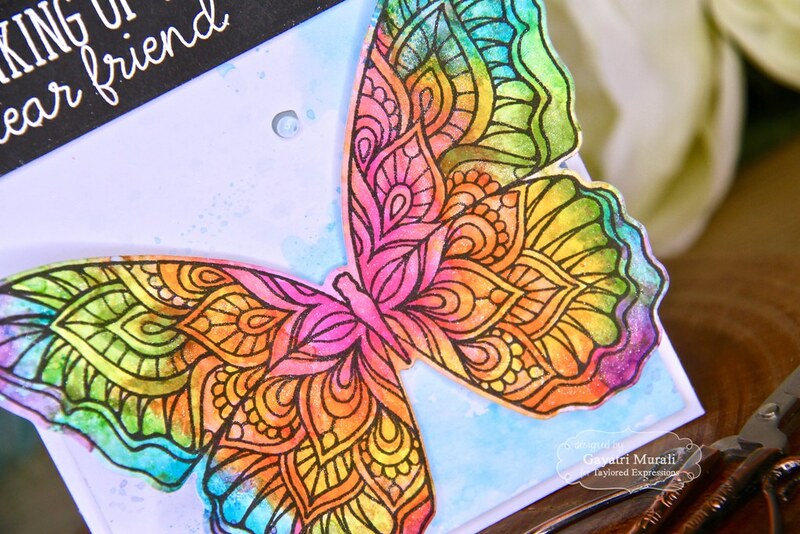 Then I stamped the Big Butterfly image using MISTI and Oreo ink. Then shaded the design inside using copic markers. I did not add layers after layers of shading with copic markers. Just a simple layer of shading so the edges of distress ink smooshing is still seen through the copic shading. 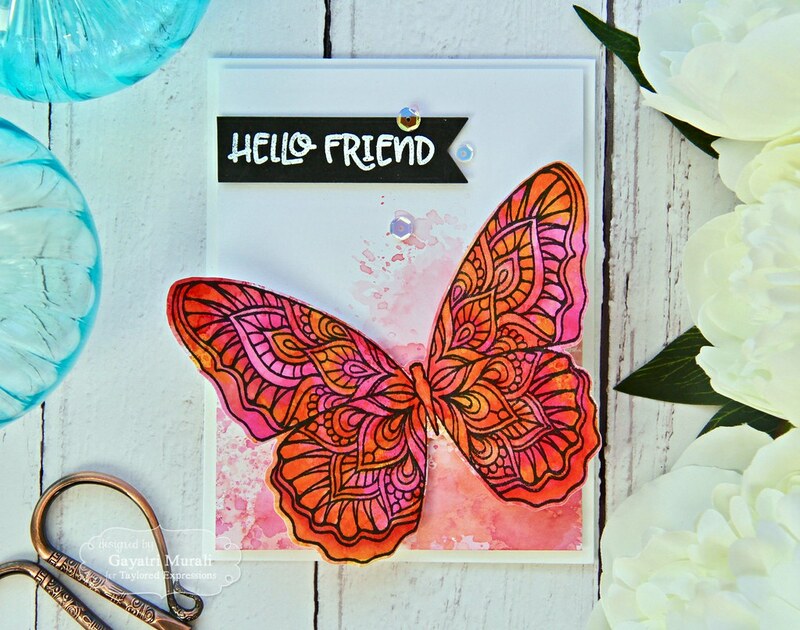 The butterfly image is die cut using the coordinating die and liberally added shimmer using Nuvo shimmer pen. 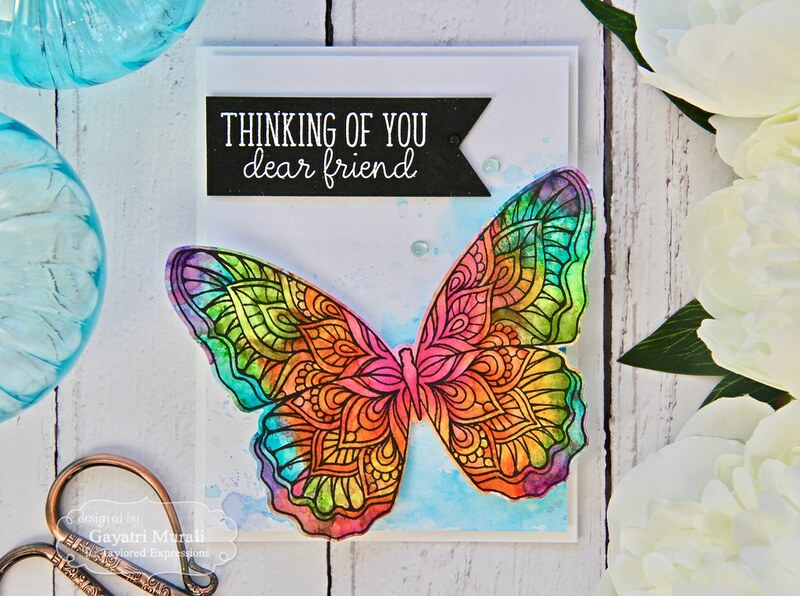 For the background on this card, I used Salty Ocean and a bit of Blueprint Sketch distress inks. Smooshing TE watercolour paper panel on a diluted inks focusing on the bottom right of the panel. Sentiment is from Friendly Phrase stamp set white heat embossed on Oreo strip of cardstock and die cut using Double Ended Flag Stacklet die. 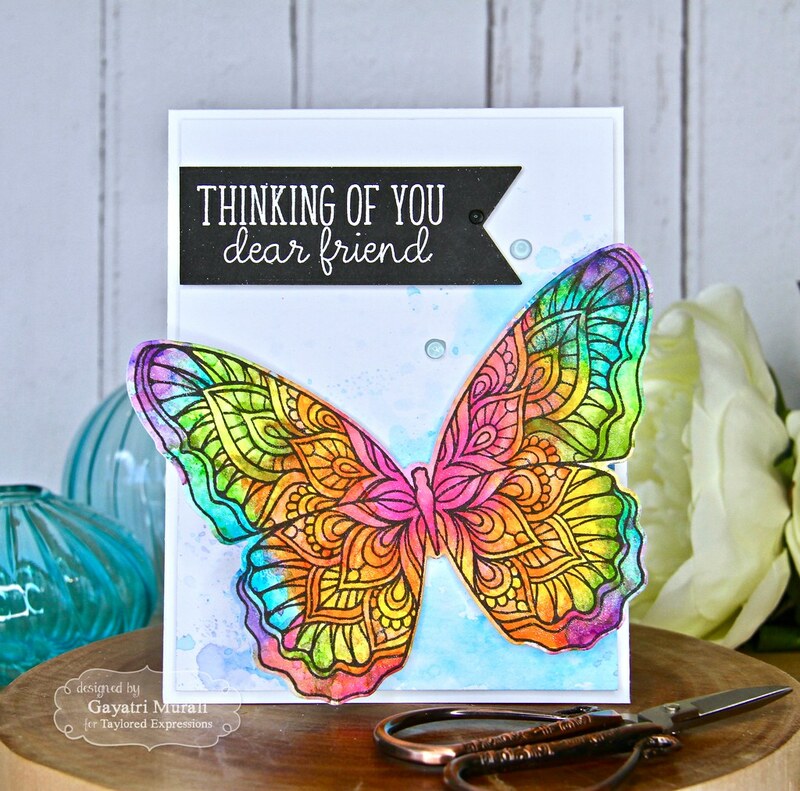 On this card, I used Nuvo Jewel drop to add accents. Which one do you like better? It is hard to pick a favourite for me as I made them both and love them both. All supplies used to make both the cards are listed below. Thanks so much for stopping by today. Have a lovely week!